Hadrianeetah has temporarily been taken off the sales list. Hadrianeetah has temporarily been taken off the sales list. Please Email for further information. 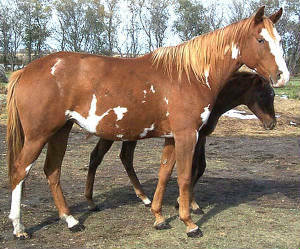 Arabian-APHA cross. 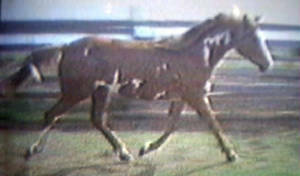 Athletic filly that is being started under saddle by a professional trainer winter 2005-2006. Excellent video clip available via Email. Balanced with a good thoatlatch. DVD available that shows her at all gaits in a large round ring. Hunter under Saddle, dressage, and other sporthorse discipline potential. Stock type for Arabian showing. Good prospect for Western-Reining disciplines too. 3/4 brother available too--2002 gelding . Solid chestnut.